1. Grind together the mint leaves, coriander leaves and green chilli to a paste. 2. Add a pinch of salt and lemon juice. Mix well. 3. 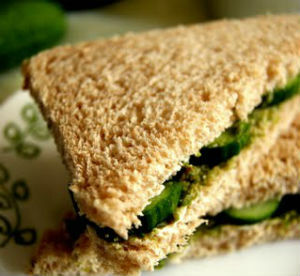 Apply butter on one bread slice and spread the ground pudina chutney on top. 4. Place a cheese slice, followed by 2 slices of cucumber and cover with another bread slice. 5. Repeat the same with the other two bread slices. 6. Toast the sandwich and serve with ketchup. Feel free to comment or share your thoughts on this Pudina (Mint) Cheese Sandwich Recipe from Awesome Cuisine.